Well, I had great hopes and dreams of a cool photo shoot of all of the quilts, but that simply is not going to happen. I haven’t been able to get out during the day — except when the wind is blowing hard or it’s raining — neither are conducive to a quilt photo shoot of a single quilt, let alone multiple quilts. So this is it. The quilt pinned to the shelves in the sewing room. This is the 2nd of 3 Disappearing 9-Patches. It measured about 79″ x 94″ before washing. Based on the picture, I’m guessing it’s about 75″ x 90″ after washing. Hobb’s Tuscany Bleached 100% Cotton batting was used (it’s what I had on hand). It was quilted on my DSM. I used my CarioQuilt thread in Military Gold to do some basic straight stitching. All the fabric is from recycled shirts, except for the green. 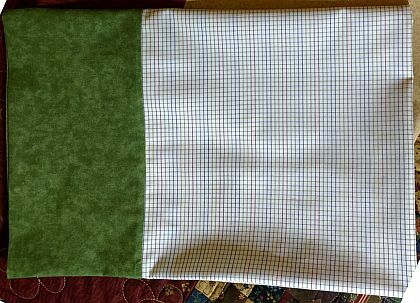 I purchased two yards of it, and had enough fabric to make the quilt and a pillowcase — well, I made the cuff narrower so I could make a cuff for Nifty Thrifty as well. Bottom line, there’s no green fabric left. 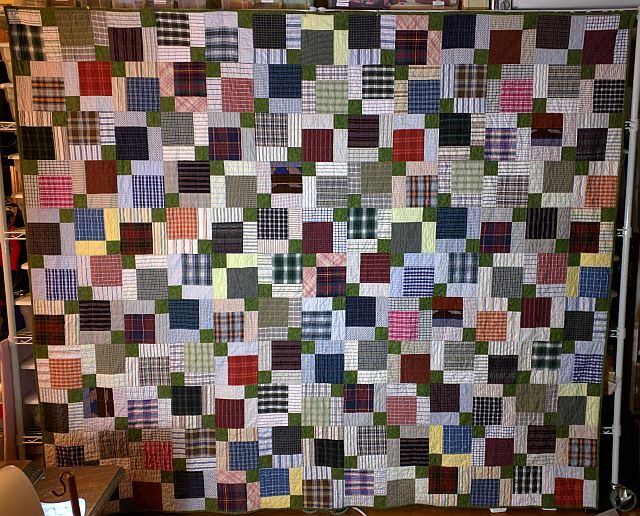 I started cutting the squares on May 19th, finished the top August 20th and finished the quilt on October 31st. It was part of the November UFO Parade at Aunt Marti’s, one of my finishes for UFO Busting over at Field Trips in Fiber, it is on my 3rd Quarter Finish Along List (it was on the 3rd quarter list, but it’s the 4th Quarter Finish Along List that I need to link to) for that On the Windy Side is hosting and of course it is a quilt on my personal Crazy Challenge II list. Ooh — nearly forgot the pillowcase.